VietNamNet Bridge - From a Nephiete gemstone block of 4.5 tons, artisans carved the statue of Emperor Tran Nhan Tong, who is praised as the most perspicacious king in the Vietnamese history. On November 12, the statue of Emperor Tran Nhan Tong was completed after more than four months of carving (at Vinh Nghiem Pagoda, Ho Chi Minh City). The giant statue is currently located in Long Thanh district, in the southern province of Dong Nai. According to a Buddhist group, who initiated the work, the prototype of this work is the statue that is worshiped at the Yen Tu Pagoda in Quang Ninh province. The gemstone block, imported from Canada, was carved into a sitting Buddha of about 1.6 meter high, 2 tons in weight; the face is inlaid with gold. 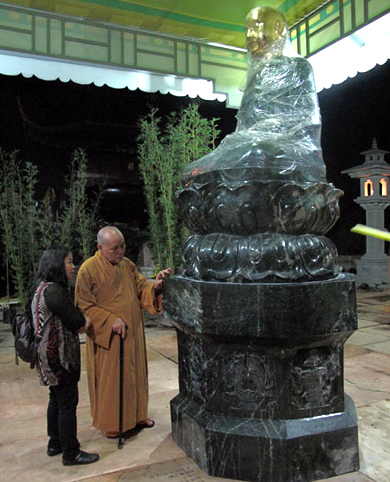 The gemstone block was blessed by the Buddhist Shangha of Vietnam as well as the 108 Dalai Lamas at the end of the October 2011. The main sculptor is artisan Dinh Danh Tu. The statue will be moved from Dong Nai to the Friendship Culture Palace in Hanoi to celebrate the Vietnamese Buddhist conference from November 22 to 24. Along with the statue, the crumbs of this giant jade block were used to make some seals based on the original seals of the Tran Dynasty. The two most beautiful seals will be donated to the Central Committee of the Vietnam Fatherland Front and the Ho Chi Minh City Fatherland Front Committee to auction for the poor. Tran Nhan Tong (1258-1308), the third king of the Tran dynasty, ascended the throne when he was just 21. He was famed for defeating Mongol invaders twice during 15 years of his reign. The king abdicated his throne at the age of 35 and spent the rest of his life on the Yen Tu Mountain practicing and propagating Buddhism, and founding the Truc Lam School of Zen (the Bamboo Forest School). 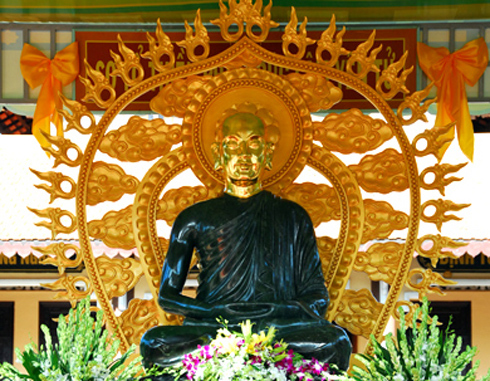 During that time, the King-Monk worked to unify different sects of Vietnamese Buddhism into Vietnamese Zen Buddhism. Vietnam currently has three “Man of Culture of the World” recognitions, namely Nguyen Trai, Nguyen Du and Ho Chi Minh.